The venue began in the 1950's as a tented facility presenting the best of Broadway on Long Island with top name talent in starring roles. 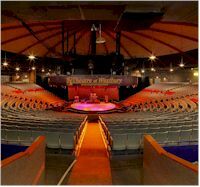 In 1966, recognizing the ever increasing hunger for more entertainment on Long Island, the tent gave way to a state of the art, fully enclosed theatre-in-the-round. The NYCB Theatre at Westbury is one of the top New York City venues for concerts and other events. Don't miss some of the biggest names in music as they come to New York City area's NYCB Theatre at Westbury to perform live.